The Cave Foros is located in Aladinou village 4 km from the town of Andros. 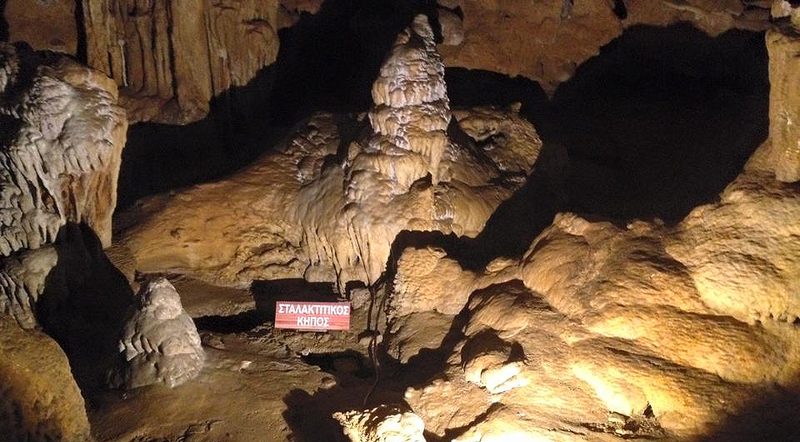 It is one of the first caves discovered in Greece. It is the 15th recorded cave in Greece, in the official chronological list of discovered caves by the Hellenic Speleological Society. 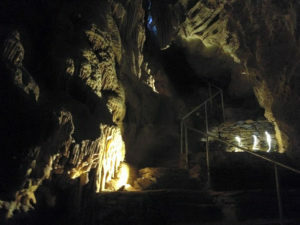 The Cave Foros with an area of about 500 sq.m. was initially explored in 1937 by John and Anna Petrochilos. In 1982, under the direction of the Hellenic Speleological Society, it was entirely mapped under the supervision of A. Petrochilos and S. Diakogiannis. For the name of the cave, Foros means tax; there are two entirely different versions. At first, the name comes from the Italian word “Foros” meaning “Opening”. The second story links the superstition of the inhabitants, who believed they were paying a tax to praise evil spirits when their sheeps and goats were falling and disappearing inside the cave. The tour starts from the old bridge, built in 1680 AD and the through a 300 meters traditional green paved path. Cave Foros offers an extraordinary sense of adventure and can be explored in groups of 6 people. At the entrance of the cave, you will be given a helmet and a flashlight, it is good to wear closed shoes and have a long-sleeved blouse with you. The temperature in the cave is constant throughout the year at 16 – 17 ° C and humidity at 75%. The visitor has the opportunity to enjoy an underground spectacle with massive columns creating excessive spaces. Diverse and colorful stalactites and stalagmites create an impressive atmosphere. Elicit formations and water cavities with cave pearls decorate its eight chambers. Life has penetrated into the Cave Foros developing unique forms of life naturally adapted to darkness and minimum food. 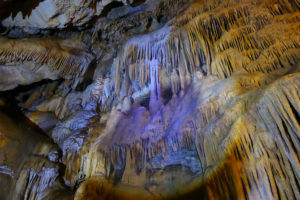 All of the above classify the Cave Foros as one of the most important attractions of Andros.